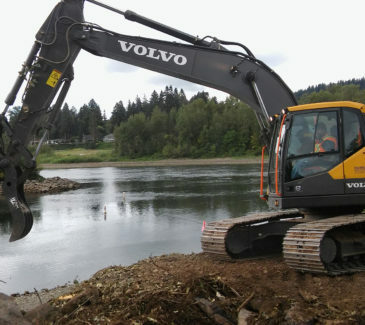 AEC was contracted by Viking Engineering and Construction to complete this environmental mitigation project, in an effort to bring stability to the shoreline, eliminate hazards and enhance the area for local fauna. 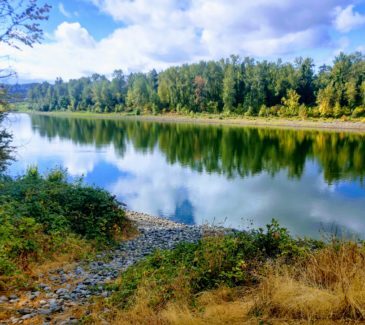 The two wildlife-rich work sites (“Bulkhead” and “Lower Parking Lot”) were located at the confluence of the tidally influenced Willamette and Clackamas Rivers near Meldrum Bar Park in Gladstone, OR. The scope involved initial tree, brush, and asphalt removal, followed by demolishing and removal of hardened features from the work areas. These included pavement, boulders, rock and riprap, debris, and sheet piles associated with the remnant bulkhead. 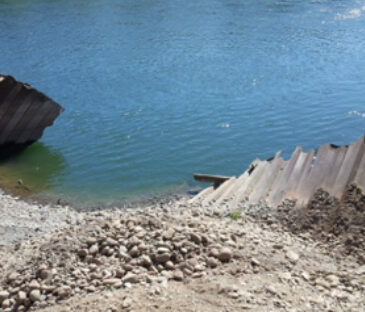 The Bulkhead site required cutting back the bank to stabilize the slope behind the removed sheet piles. 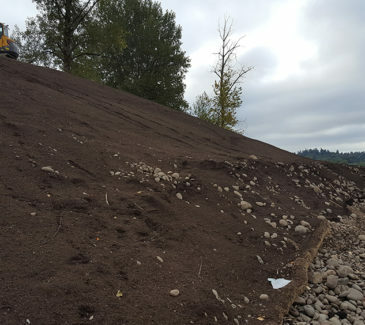 Crews excavated and stockpiled the material from the slope in order to reuse the maximum amount as cover material for the slopes at both sites. 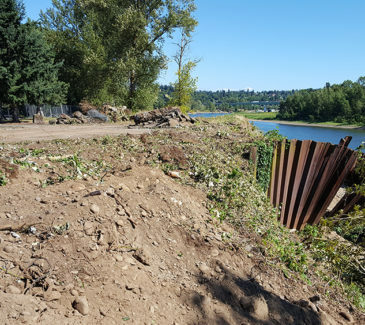 Additionally, after the new slope was established at the Bulkhead location, a soil amendment of imported compost material was added and mixed into the cobble material by running a bulldozer up and down the slope. This was done in an effort to jumpstart organic development and help the fall plantings take root more easily. The Lower Parking Lot site work involved lowering the floodplain and building two rootwad structures to protect the existing park site and provide refuge for fish during high water conditions. 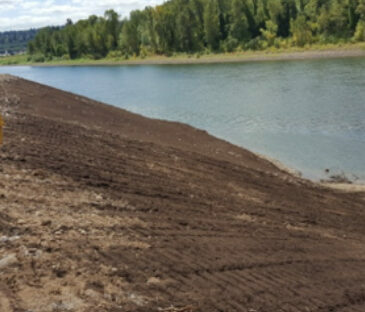 Crews also constructed a small stormwater basin to ensure water flowing from the parking lot above was filtered through the surrounding soils prior to entering the Willamette River, while maintaining water quality conditions per Oregon DEQ regulations. 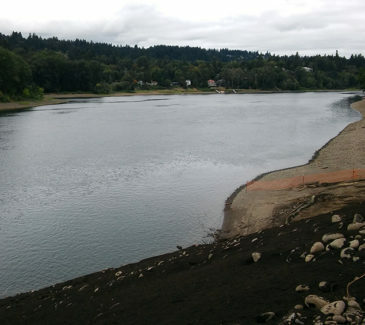 Challenges to the project included working in close proximity to the public, and alongside multiple entities with a vested interest in the work performance, including the general contractor, the City of Gladstone, the Port of Portland, and multiple engineering firms. 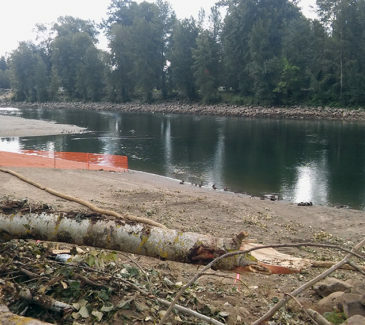 Additionally, AEC required our subcontractor to re-survey the area in the initial phases of the project, as many of the original stakes had been knocked loose by fluctuating water levels and boat traffic, and even removed by some of the wildlife. Prior to project completion, AEC managed the installation of a chain link fence along the upper perimeter of the slope to prevent pedestrian traffic and allow the plantings and hydroseeding to establish.